I sewed a pair of trousers. The title of this post may let you imagine something bold and spectacle to wear for certain special occasion, but they're not. I don't have any plan for attending parties, I even don't have a chance to pass by the doors of banquet hall where people dress brightly in the nice outfits. My trousers are for everyday use. Anyway, I've longed for trousers that have something like thick embroideries, metallic content, laces, sequins, etc... anything with statements in their texture without deep colors for some long time. People might have thought differently though, I was thinking it was a cool idea. Recently I met this lace fabric for my plan that had been incubated for too long and my job was done on it pretty quickly. I think you can see I really love them. This was probably one of the biggest let-off-steams of my swelling ball of plan for sewing, and I am very glad with that I tried. In my opinion they're less spectacle than I imagined from the raw materials I used. That is rather a bonus. Maybe I can think that my gold trousers can make any day a special day for me, and they themselves are the occasion (you're suggested to voluntarily laugh at the writer here). Do you have special plans that you've been secretly incubating in your mind? I have one more. 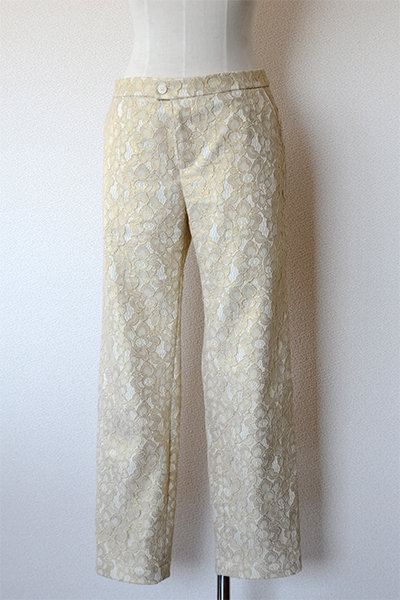 pattern: Cropped tapered pants "Quartz" from Tamanegi-kobo (PDF pattern), shortened quite a lot. 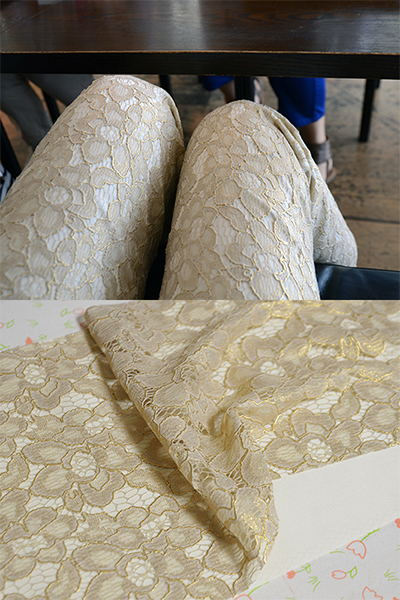 fabric: champagne gold lace and polyester trouser-weight fabric with some stretch, stacked and used (only attached at seams). I've recently uninstalled Disqus comment system because it didn't accept some genuine comments all the time. Because it seemed OK on keeping the comments that were previously received by looking at my recent posts, I wasn't worried too much about the change. However, I've just found that it seems that I have lost many of your lovely comments which were made via Disqus in the old posts. More than some are still here, but many are gone... So sad. I don't care even if I lost my posts themselves, but I do feel very sad when your comments are gone. 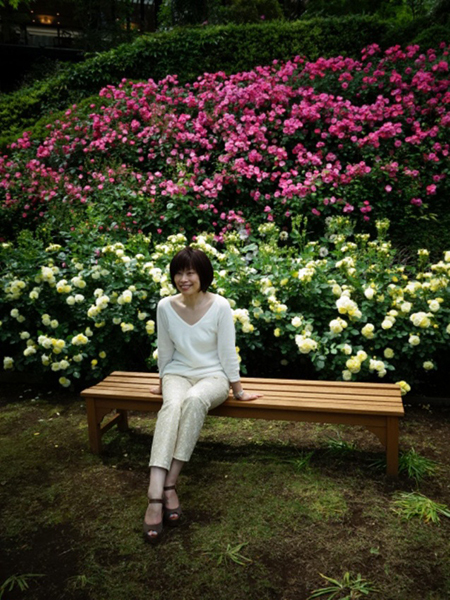 At moment I don't know how many of them disappeared, or how to restore them. Please accept my apology if I cannot restore them properly. So sad.